VANCOUVER, BC – In one week’s time, the Americans went from being served to dishing out the humble pie. 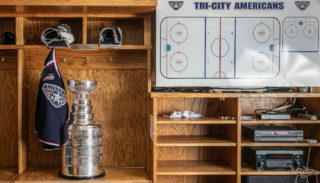 Brendan Shinnimin scored twice and Carter Ashton collected four points as the Tri-City Americans (39-21-2-2, 82 pts) toppled the Vancouver Giants (33-27-1-4, 71 pts) 5-1 in front of 6,225 fans at Pacific Coliseum. With the win, the Americans have now won two straight and clinched the four-game season series with the Giants, who shutout Tri-City 5-0 last Sunday. Meanwhile, the hurting Giants have now dropped three straight and five of their last seven. On Sunday, Tri-City jumped on the Giants early and never looked back, scoring just nine seconds into the contest. After he won the opening face-off, Shinnimin took a pass from Ashton and buried a wrist shot under the glove of Mark Segal, putting the Americans on top 1-0. Then, with just 40 seconds remaining in the first period, Ashton fed Kruise Reddick in the slot, who banked a shot off the crossbar, and past Segal, to put Tri-City up by two headed into the first intermission. Early into the second period, though, a Tri-City turnover allowed the Giants to climb back into the game. Behind the Americans’ net, Paul Sohor tossed the puck away to Michael Burns, who brought it uncontested into the slot. Burns then slipped a shot past a startled Drew Owsley, pulling Vancouver to within one. But, with less than a minute remaining, and on the power play, Reddick had his shot blocked by Vancouver’s Wes Vannieuwenhuizen, only to have it wind up on the stick of Ashton. Ashton then wrapped a shot by Segal, as Tri-City regained their two-goal lead headed into the third period. Tri-City added two more in the third period, one by Matt MacKenzie and a second by Shinnimin, to round out the scoring in the contest. MacKenzie, who scored only 3:40 into the period, notched his second goal in as many games. Meanwhile, with less than five minutes remaining gin the game, and on the power play, Shinnimin deflected a shot by Ashton for his 29th goal of the season. Owsley, who made his second straight start since returning from the disabled list, picked up 18 saves on 19 shots to earn his 32nd win of the season. On the other end, Segal allowed five goals on 24 shots in 55 minutes of work before giving way to back-up Brendan Jensen for the final five minutes. Jensen stopped the only shot he faced in relief. Tri-City finished the night 2-for-3 on the power play and was a perfect 3-of-3 on the penalty kill. 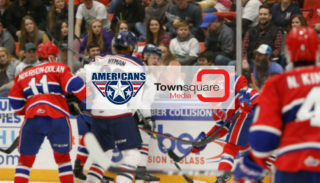 In the middle of their last major road trip of the season, the Americans will now take their road show to Interior Savings Centre, where they will face-off with the Kamloops Blazers (29-34-3-1) on Tuesday, March 8. Game time is 7:00 p.m. 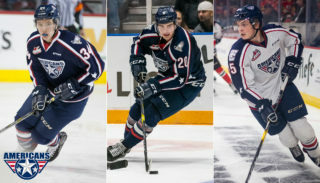 The Americans had their seven-game winning streak vs. the Blazers snapped in their last meeting, a 3-2 shootout loss back on February 15 in Kamloops. Meanwhile, the Blazers come into Tuesday’s match-up having lost three straight and in a heated battle for the last playoff spots in the conference. 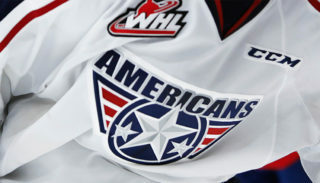 Fans can catch all the action live, via WHL Live, at the Americans’ home away from home, Kimo’s Sports Café in Richland. The game will also be broadcast live on NewsTalk 870 AM, starting with the Sterling Savings Bank Warm-up Show at 6:45 p.m.